Thank heavens. Pants that weren’t pilfered from the Ramones tour bus! Not a bad effort but as ever with the continentals a trifle overworked in places – e.g. number one’s shoe tips. I love their pattern/color combining, their casual pants and burnished leather shoes. Sartorialists from a planet much more imaginative than our own. I don’t entirely know what to do with all the pattern mixing and shoes (especially with the blue jacket/black belt/brown shoe lad) but they’re both seriously handsome. i love the fact that number one’s tie is relaxed…i work at a law firm and hate when everything has to be perfect – it’s inhumane in a superficial way. Both the guys are a perfect example of what the true neapolitam elegance is: wonderful fabrics, splendid cutting according to the neapolitan school(natural shoulders , high notch lapels , patch pockets togheter with a edge cut (jetted) breast pocket ), very sober shirts and ties and just a note of brightness represented by burnished shoes. This is the restraint that is the secret of every elegant man.Please look at the difference in term of understatement with other pictures such as Lino in GQ and Harmless Bravado that appear much more overstated. I’d take either one of them! Kiton, uses the most fantastic fabrics. I bought a coat on sale several years ago tweed cashmere outside lined in silk. It’s big on me but I don’t care. It feels heavenly and I’m sure these gents do too. The New Yorker did a long article on Kiton, a few years ago. I like the older gent better.His shoesare of better quality and though they both wear ties in same shades,I think the older man has pulled the outfit more elegantly. always, always, always too soft. like most purebred style even the italian kiton-look lacks subtlety and cultural refinement – at least in my book. only pure british style is different – because it is there where irony, fragmentations, contrasts and refined neglect are at home. That look is so fresh–light trousers, a jacket with color, and great-looking shoes. I also love that building. Some well dressed gents. Beautiful jackets. Well done, as usual! 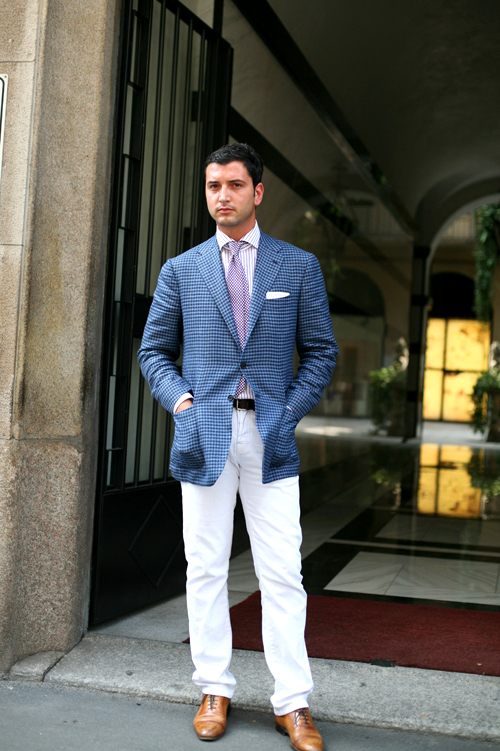 I really like the pairing of a sports jacket or blazer with white trousers, as in pic #2. I’ve seen a lot of that in Milan the last two seasons. It’s a classic look. American guys don’t wear enough white trousers. Nice shoes in pic #2 too. I don’t know what mark means by “overworked” but I find this look to be, with very few exceptions, perfect–the shoes in particular. 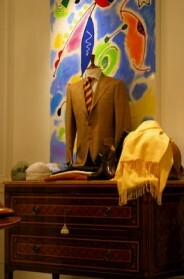 The “continentals” so to speak have a fine sensibility when it comes to class and luxury. This exemplifies that. woah… that’s the way i wanna dress when i grow up! I admire the fact that he is wearing cap toes with jeans. Its not something I would try. Don’t the pants seem a tad on the long side, though? 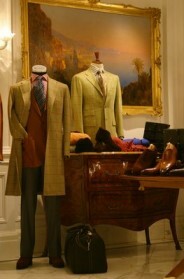 Carlene, I agree with you these two gentlemen are very imaginative and wearing Neopolitan design helps. agree with mark from london above. 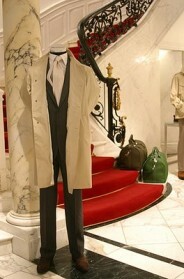 however kiton wearer might tweak things differently than bespoke wearer in london. Pants come just to the top of the shoe in top photo, but are quite long in bottom photo. Are both ok? Both have pluses and minuses. Top, inside tie blade is longer than the outside one, pants too snug. Bottom, pants too long and also too snug. But the patterning of the jacket on guy below is great. And the fit on top guy’s jacket appears to be very pleasing. And both, of course, are showing exemplary attention to what they wear…. These two photographs illustrate the fact that if you’re going to go the sport coat, tie and casual slacks route it’s best to stick to relatively muted colors that play off each other…quietly. Number one has the concept mastered. And even though a black belt with brown shoes is probably a fashion no-no, his presence – the calm self-assurance of the middle aged male who doesn’t have to prove a thing – makes it hardly noticeable. Number two isn’t there yet. But he’s got youth. And macho. Good things to have. I don’t like how the back end of the tie on the first guy is that long. He should buy shorter ties or have this one tailored. Did they ever come from Kiton in Milan. Why can’t American guys dress like this? The pants: fitted, not skintight (memo to men: never, ever, ever wear skinny jeans, you have no idea how unsexy you look). The blazers: tailored and just flashy enough. The grooming: it’s clear that these guys actually do it. absolutely loooove italian men. i think the guy in brown is sexier than the guy in blue though. #1 looks smashing! Are those cotton poplin trousers? Sart, please advise if you know…#2 seems to be trying a bit too hard. its that clean tailored look that i aspire to. thanks for this. it opens up a different approach for yanks. I love this look. I own a number of odd jackets and have, over the past year, eliminated anything with too much shoulder padding. Softer jackets look worlds better on a man who already has substantial shoulder/upper body presence. And I don’t just mean muscle. Overwide shoulders tend to make you look like a refugee from an 80′s movie or someone left a hanger in the jacket. I think a number of posters have missed the fact that #1′s tie is intended to look like that. It’s a classic manifestation of sprezzatura. In the same way, the beautiful, even dramatic, shoes are part of their calculated looks. The disheartening part is that they are probably both wearing nearly $10,000 worth of Kiton at retail. For the first time in a long while, I find the shorter pant length on the first gentleman more appealing than the longer pants on the second. Standing up that is, I still find shorter pants unattractive when the wearer is seated. I wish I saw men dressed that well everyday here in New York. I swear I might have to move to Italy soon! #1 makes the difficult look easy. The tan patterned coat, with the perfectly light pants to compliment (and the shoes are perfect). It works. Completely. I would abuse a kiton employee discount so bad, they would go bankrupt in a week. I guess everyone envies all the people in that line of work in that regard, but something about cashing my paycheck, walking to the office on the next floor, and ordering a suit that costs more than my car is just wonderful. Wonderfully classy outfits, though I am not sure if the average guy can pull off that blue checked jacket in the bottom photo. I think I’ll just make an effort to duplicate that top outfit myself – it’s perfect. wow! they look great! but you’re showing clothes that actually fit the wearers instead of stuff that’s way too tight and short! what’s up, Sart? No. 2′s black belt creates a dichotomy of the style that in no good way divides the grace of this outfit. In fact it seems the belt is some old overhaul found in hast before leaving the house, and as such spoils the entire effect. A lighter color, a slightly broader belt, or if a black belt is required to keep things formal than the shoes should atleast fall into a dark spectrum of leather. Un peu too much non ? Des rayures, des carreaux, wow… Et une ceinture noire avec des chaussures camel. De plus on ne porte pas de richelieu mais des derby quand on n’a pas de costume.